Welcome to the RHDJapan blog! Here is a great campaign to highlight some more great savings from RHDJapan. This campaign includes a couple different discounts which add up to be by far the best pricing available. As noted in the previous blogs we now automatically apply discounts when purchasing more than one item from select brands. 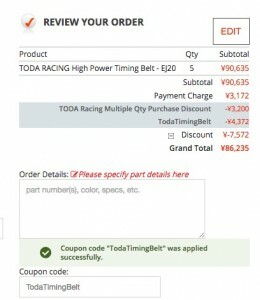 TODA Racing is one example in which we provide a JPY800 discount per each item over Qty1 purchased. 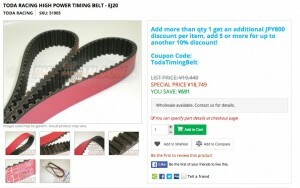 In addition, we are extending a 5% discount on any of the TODA Timing Belts when purchased in Qty 5 or higher. 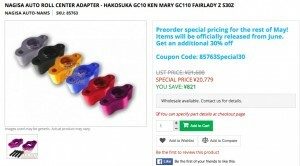 This is also on top of the Multiple Quantity Discount that is applied when several of the same part number is being purchased. 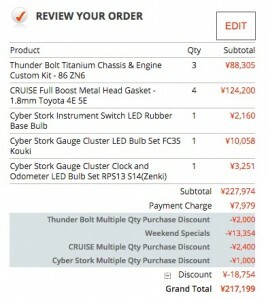 Therefore in this campaign we would have a JPY3200 discount for Multiple Qty purchased of TODA product. A 5% (JPY4372) discount is further deducted in observation of this campaign. 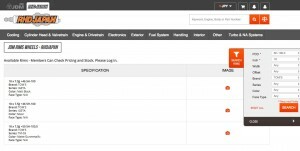 Further more the unit price of the item is reduced from JPY18749 to JPY18127 for another overall reduction of JPY3110. With over JPY10,000 in additional discount this savings is enough to consider stocking up or going in as a group buy. Adding to the extensive list brands that have just become more affordable are a couple more niche JDM manufacturers including Craft Square, Cruize High Performance, Final K0nnexion, Ganador, KOYO, Night Pager, ODULA, REIMAX, Revolution, Work Wheels! In celebration we are going to put all revised brands on Weekday POP special until Thursday at Midnight! 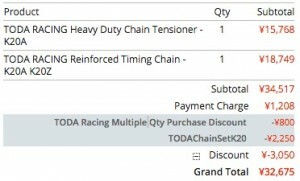 Add multiple items from any of the manufacturers to your shopping cart and automatically see discounts applied in the shopping cart (some exceptions). Add the coupon code for the Weekday POP Specials and see additional discounts apply to the order! Welcome once again to the RHDJapan blog. The Weekday Pop specials that were originally scheduled to expire tonight have been moved to this batch of Weekend Specials which will increase the discount % and also extend the offer by 2 days! In addition we have added over 50 more brands to the list which brings us to over 100! All brands in the list have improved pricing and can be used in conjunction with the Weekend Specials for the best pricing as of yet! Welcome once again to the RHDJapan blog. RHDJapan is proud to announce a campaign for the full DEFI lineup, this includes all meters and gauges along with option sensors and replacement parts. Better pricing on 100 different products from this brand! RHDJapan is also offering a GReddy Sunshade as a FREE Service with select items from the site. Look for the Promo Badge to see which items quality! Weekday POP Specials will also be available for the following brands! Back in action is the seasonal and extremely popular Project Mu Brake Pad Campaign! Nagisa has come through in support of the Old School JDM Legends with the release of the Roll Center! Get a one-time major discount on the first lot to be manufactured! Deadline for manufacturing will be the end of this month. 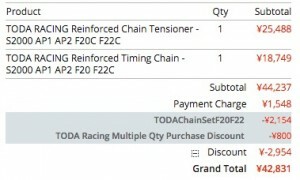 This campaign is specifically for K20 K24 F20 and F22 owners looking to upgrade the chain and tensioner at the same time. 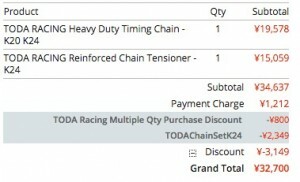 The semi-annual Project Mu Brake Pad Campaign back to bring a nice discount for set purchases.